Sailing your boat along a restored Grantham Canal from the River Trent to the A1 terminus at a leisurely pace will take around two days. And the half-way point on your cruise is the Leicestershire village of Hose, in the Vale of Belvoir. Situated around ¾ mile from the canal you won’t find much in the way of amenities in Hose these days, but you WILL still find two splendid pubs; “The Rose & Crown” and “The Black Horse”. 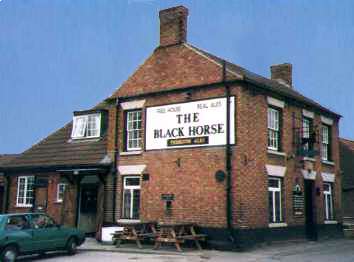 The Black Horse is a square, red brick hostelry on a lane to the south of the village, built as a pub around 150 years ago. The wonderful wrought iron sign of a cantering black horse still hangs above the front door and the paddock at the rear remains – this is now a children’s play area with outside seating for the summer. Thankfully the character of the pub seems to have changed little over the years; with an extension to incorporate the once outside toilet block into the building being one of the few concessions to modern times – even the skittle alley survives! The genuine leaded windows add to the traditional feel and all the rooms remain separate. The tap room is no longer the “men-only” bar it used to be but still has a flag floor, dart board and outside hatch; the lounge is a little larger and more comfortable for couples; whilst the largest wood-panelled room at the rear is now used as a family restaurant. A wonderful feature in the winter is the real open fires throughout, and you’re assured a warm welcome from Ben and Rubbish – the dogs! Equally welcoming are mine hosts Mick and Gail Aram who have been tenants at The Black Horse for around four years now – only the third time the licence has changed hands in forty years! They’re proud of the unspoilt and traditional nature of the pub and – being part of the “Tynemill” chain – it’s no surprise to discover six hand-pulled real ales at the bar; three regular beers (including a fabulous MILD!) and three guests. But truly home made food is also on the extensive menu served Wednesday to Saturday lunchtimes and evenings along with a traditional Sunday Lunch. The couple of dozen portraits of scantily-clad women by painter David Wright (no relation!) on the restaurant walls have an interesting history:- They were found when clearing out a former paper shop in Wellingore and originate from “The Sketch” magazine of the mid-1940s. Mick and Gail fell in love with them and had them framed and displayed in their previous pub so they just had to bring them along! Also in the restaurant note the beautiful mounted stained-glass window panel on the mantle-piece rescued from the original pub windows changed in the 1940s. Mick welcomes the restoration of The Grantham Canal: “We already get lots of walkers and cyclists from the canal popping in for lunch so it’s great that it’s being opened up again for boats as well”. And boaters won’t see any rubbish at The Black Horse…….except, of course, the dog!